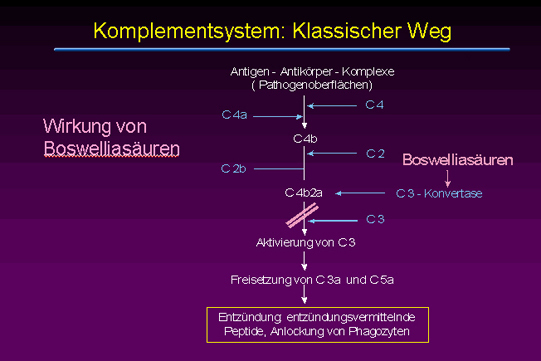 Es ist offenbar, dass wohl im Wesentlichen Teile des Immunsystems, die an Autoimmunerkrankungen beteiligt sind, als Ziel der Wirkung von Boswelliasäuren infrage kommen. Effects of Roxb. and L. in an In Vitro Intestinal Inflammation Model Using Immune Cells and Caco-2. Inflammatory bowel diseases, which consist of chronic inflammatory conditions of the colon and the small intestine, are considered a global disease of our modern society. Recently, the interest toward the use of herbal therapies for the management of inflammatory bowel diseases has increased because of their effectiveness and favourable safety profile, compared to conventional drugs. Roxb. and L. are amongst the most promising herbal drugs, however, their clinical use in inflammatory bowel diseases is limited and little is known on their mechanism of action. The aim of this work was to investigate the effects of two phytochemically characterized extracts of and in an in vitro model of intestinal inflammation. Their impact on cytokine release and reactive oxygen species production, as well as the maintenance of the intestinal barrier function and on intestinal mucosa immune cells infiltration, has been evaluated. The extracts showed a good protective effect on the intestinal epithelium at 1 µg/mL, with TEER values increasing by approximately 1.5 fold, compared to LPS-stimulated cells. showed an anti-inflammatory mechanism of action, reducing IL-8, TNF-α and IL-6 production by approximately 30%, 25% and 40%, respectively, compared to the inflammatory stimuli. action was linked to its antioxidant effect, with ROS production being reduced by 25%, compared to H₂O₂-stimulated Caco-2 cells. and resulted to be promising agents for the management of inflammatory bowel diseases by modulating in vitro parameters which have been identified in the clinical conditions. Acetyl-11-Keto-β-Boswellic Acid Promotes Osteoblast Differentiation by Inhibiting Tumor Necrosis Factor-α and Nuclear Factor-κB Activity. Tumor necrosis factor (TNF) -α plays a crucial role in rheumatoid arthritis (RA)-related bone loss disease. The main mechanism of action of RA induced bone loss is the significant inhibitory effect of TNF-α on osteoblast differentiation. TNF-α inhibits osteoblast differentiation mainly by activating nuclear factor (NF) -κB signaling pathway. Owing to the crucial role of TNF-α and NF-κB in the inhibition of osteoblast differentiation, they are considered as targets for the development of therapeutic drugs. In the present study, we evaluated the NF-κB inhibitor Boswellic acid (BA) and its derivatives in the regulation of osteoblast differentiation and the molecular mechanism. Based on the cell model of TNF-α induced inhibition of osteoblast differentiation of MC3T3-E1, the regulatory role of BAs was studied. The result of MTT assay indicated that bone morphogenetic protein (BMP) -2, TNF-α, or acetyl-11-keto-β-BA (AKBA) impact no significant effect for cell viability of MC3T3-E1. The results of alkaline phosphatase (ALP activity assay and real-time polymerase chain reaction indicated that AKBA blocked TNF-α-induced inhibition of the expression of osteoblast markers, suggesting that AKBA rescued osteoblast differentiation from TNF-α-induced inhibition. Additionally, AKBA stimulated the BMP-2-induced expression of osteoblast markers, suggesting that AKBA promotes osteoblast differentiation directly. The results of western blotting and luciferase assay indicated that N-κB signaling was activated by TNF-α. The overexpression of NF-κB component p65 in MC3T3-E1 was found to attenuate the positive effect of AKBA in osteoblast differentiation, suggesting that AKBA potentiates osteoblast differentiation by inhibiting NF-κB signaling. Collectively, AKBA promotes osteoblast differentiation by inhibiting TNF-α and NF-κB. Our study revealed a new discovery of AKBA in regulating osteoblast differentiation, and demonstrated that AKBA may be a potential anabolic agent in the treatment of RA-derived bone loss disease. J Craniofac Surg. 2018 Oct;29(7):1996-2002. Acetyl-11-keto-β-boswellic acid inhibits the secretion of cytokines by dendritic cells via the TLR7/8 pathway in an imiquimod-induced psoriasis mouse model and in vitro. AIMS: Psoriasis vulgaris is mediated by T and dendritic cells. This study aimed to investigate the effects of acetyl-11-keto-β-boswellic acid (AKBA) on activated dendritic cells (DCs) using an imiquimod (IMQ)-induced psoriasis-like mouse model and murine bone marrow-derived dendritic cells (BMDCs) stimulated with resiquimod (R848) in vitro. MATERIALS AND METHODS: The mice were treated with IMQ and intragastrically administered 25-100 mg/kg/day of AKBA, 1 mg/kg/day of methotrexate (MTX), or normal saline. The inflammation of skin lesions in IMQ mice were evaluated by psoriasis area and severity index (PASI) and pathological staining. The related proteins of Toll-like receptor (TLR)7/8 pathways were assessed using Western blotting, and the expression levels of interleukin (IL)-23 and IL-12p40 mRNA using reverse transcription-polymerase chain reaction. The numbers of DCs and marker-positive BMDCs were assessed using flow cytometry and the levels of inflammatory factors using the enzyme-linked immunosorbent assay. KEY FINDINGS: AKBA and MTX obviously improved the psoriasis-like skin lesions of IMQ-treated mice. AKBA also obviously decreased the PASI score, reduced the thickness of epidermis, ameliorated the infiltration of CD3+ and CD11c+ cells in skin lesions, decreased the activation of local DCs, inhibited the mRNA expression and secretion of inflammatory factors IL-12 and IL-23, inhibited the maturation and differentiation of DCs to promote T-cell differentiation, and inhibited the activation of TLR7/8 and IRF signaling pathways. SIGNIFICANCE: This study implied that AKBA might have an anti-inflammatory effect on psoriasis by inhibiting the maturation and activation of DCs via the TLR8 and IRF signaling pathways. Herbal Products for Common Auto-Inflammatory Disorders - Novel Approaches. BACKGROUND: Common auto-inflammatory disorders (CAIDs) constitute a wide array of ailments ranging from acute allergies to chronic conditions. Globally, CAIDs remain one of the leading causes of disability and morbidity. Despite playing a leading therapeutic role, the vast profusion of anti-inflammatory synthetic agents have not been able to fully resolve a panoply of CAIDs. Additionally, contemporary synthetic therapy approaches remain bounded by a wide array of limitations essentially being adverse effects and unaffordable costs. In this advent, the use of herbal products provides an interesting avenue to explore in view of developing such treatment regimens. OBJECTIVE: This review article endeavors to highlight potential herbal products and isolated phytochemicals which can be of benefit in the prophylaxis, management, and treatment alongside avoiding the relapse of CAIDs. CONCLUSION: This review article has highlighted that herbals, herbal products, and isolated metabolites hold a huge potential in the prophylaxis, management, and treatment of CAIDs. Herbals can act on various targets involved in the pathogenesis of inflammatory disorders. In addition, novel approaches for the management of CAIDs are numerous. Indeed, nanoparticles loaded with phytochemicals have been developed to specifically target the colon for IBD treatment. In silico approaches using herbals also offer unlimited avenues to decipher new pharmacophores. Investigating the potential of polyherbal formulations is another unique approach which can be investigated. Given the inefficacy of conventional medicines, the concomitant use of conventional and herbal medicines can also be explored. Comb Chem High Throughput Screen. 2018;21(3):161-174. The major Boswellia serrata active 3-acetyl-11-keto-β-boswellic acid strengthens interleukin-1α upregulation of matrix metalloproteinase-9 via JNK MAP kinase activation. BACKGROUND: Boswellia serrata gum resin has attracted pharmacological interest as an alternative antinflammatory. PURPOSE: We studied the application of an ethanolic extract of the resin and its main active 3-O-acetyl-11-keto-β-boswellic acid (AKBA) against inflammatory degeneration of skin extracellular matrix. STUDY DESIGN: We compared the effects of the extract and AKBA on the activity of MMP-2 and MMP-9 (72-kDa and 92-kDa type IV collagenases) in HaCaT keratinocytes exposed to interleukin-1α (IL-1α) as a skin inflammation model. METHODS: MMP activity in cell conditioned medium was assayed by gelatin zymography, while NF-kB and MAP kinase activations were evaluated by Western blotting. RESULTS: IL-1α (10 ng/ml) upregulated MMP-9 but not MMP-2 in HaCaT cells. The extract, used at 2.3, 4.6 and 9.3 µg/ml, had no effect, but in combination with IL-1α showed MMP-9 inhibition at the lowest dose and increased upregulation at the highest one. AKBA alone, at the same concentrations (corresponding to 5, 10, and 20 µM), did not stimulate MMP-9, but together with IL-1α induced an increased upregulation at the lowest dose that progressively disappeared at higher doses. WB analysis showed that IL-1α induced phosphorylation of NF-κB p65, while AKBA abolished this effect at 20 µM, but conversely increased it at 5 µM. Screening of MAP kinase phosphorylation showed a combined activation of IL-1α/AKBA on JNK, while the JNK inhibitor SP600125 abolished MMP-9 upregulation induced by IL-1α/AKBA. CONCLUSION: The enhancing effect of IL-1α/AKBA on MMP-9 at low AKBA concentration seems to involve the activation of JNK-mediated NF-κB pathway. Conversely, the extract inhibits the IL-1α effect at low doses, but not at higher ones, where AKBA and possibly other β-boswellic acids reach concentrations that potentiate the effect of IL-1α. The extract at low doses could protect the skin against degenerative processes of extracellular matrix, while keto-β-boswellic acids seem unsuitable for this purpose. Antioxidant and Immune System Regulatory Properties of Extracts. (BS) is an important traditional medicinal plant that currently represents an interesting topic for pharmaceutical research since it possesses several pharmacological properties (e.g., anti-inflammatory, antimicrobial, and antitumour). The safety and versatility of this dietary supplement should allow for its use in numerous pathological conditions; however the quality of the extracts needs to be standardized to increase the clinical success rate resulting from its use. In the present study, different commercially available extracts were employed to compare their AKBA content and in vitro antioxidant power. Furthermore, their ability to modulate the immune system regulatory properties was investigated. Our results showed that the AKBA content varied from 3.83 ± 0.10 to 0.03 ± 0.004%, with one sample in which it was not detectable. The highest antioxidant power and phenolic content were shown by the same extract, which also exhibited the highest AKBA concentration. Finally, the BS extracts showed the ability to influence the regulatory and effector T-cell compartments. Our results suggest that frankincense should be further investigated for its promising potentiality to modulate not only inflammation/oxidative stress but also immune dysregulation, but attention should be paid to the composition of the commercial extracts. Oxid Med Cell Longev. 2017;2017():7468064. Analogues of boswellic acids as inhibitors of pro-inflammatory cytokines TNF-α and IL-6. A library of boswellic acid analogues were synthesized and tested for their anti-inflammatory potential on key inflammatory mediators, TNF-α and IL-6. The study led to the identification of lead compounds showing significant inhibition of the cytokines, TNF-α and IL-6 both in vitro and in vivo. Bioorg Med Chem Lett. 2016 Jan;26(2):695-698. Boswellic acids target the human immune system-modulating antimicrobial peptide LL-37. The antimicrobial peptide LL-37 is the sole member of the human cathelicidin family with immune system-modulating properties and roles in autoimmune disease development. Small molecules able to interact with LL-37 and to modulate its functions have not been described yet. Boswellic acids (BAs) are pentacyclic triterpene acids that are bioactive principles of frankincense extracts used as anti-inflammatory remedies. Although various anti-inflammatory modes of action have been proposed for BAs, the pharmacological profile of these compounds is still incompletely understood. Here, we describe the identification of human LL-37 as functional target of BAs. In unbiased target fishing experiments using immobilized BAs as bait and human neutrophils as target source, LL-37 was identified as binding partner assisted by MALDI-TOF mass spectrometry. Thermal stability experiments using circular dichroism spectroscopy confirm direct interaction between BAs and LL-37. Of interest, this binding of BAs resulted in an inhibition of the functionality of LL-37. Thus, the LPS-neutralizing properties of isolated LL-37 were inhibited by 3-O-acetyl-β-BA (Aβ-BA) and 3-O-acetyl-11-keto-β-BA (AKβ-BA) in a cell-free limulus amoebocyte lysate assay with EC50=0.2 and 0.8 μM, respectively. Also, LL-37 activity was inhibited by these BAs in LL-37-enriched supernatants of stimulated neutrophils or human plasma derived from stimulated human whole blood. Together, we reveal BAs as inhibitors of LL-37, which might be a relevant mechanism underlying the anti-inflammatory properties of BAs and suggests BAs as suitable chemical tools or potential agents for intervention with LL-37 and related disorders. Nat Prod Commun. 2014 Sep;9(9):1351-6. Extract from gum resin of Boswellia serrata decreases IA(2)-antibody in a patient with "Late onset Autoimmune Diabetes of the Adult" (LADA). Rheumatoid arthritis (RA) is a chronic inflammatory disease which leads to destruction of joints. Current treatment modalities for RA either produce symptomatic relief (NSAIDs) or modify the disease process (DMARDs). Though effective, their use is also limited by their side effects. As a result, the interest in alternative, well tolerated anti-inflammatory remedies has re-emerged. Our aim was to evaluate the antioxidant and antiarthritic activity of Boswellia serrata gum resin extract (BSE) in collagen induced arthritis. Arthritis was induced in male Wistar rats by collagen induced arthritis (CIA) method. BSE was administered at doses of 100 and 200mg/kg body weight once daily for 21 days. The effects of treatment in the rats were assessed by biochemical (articular elastase, MPO, LPO, GSH, catalase, SOD and NO), inflammatory mediators (IL-1β, IL-6, TNF-α, IL-10, IFN-γ and PGE2), and histological studies in joints. BSE was effective in bringing significant changes on all the parameters (articular elastase, MPO, LPO, GSH, catalase, SOD and NO) studied. Oral administration of BSE resulted in significantly reduced levels of inflammatory mediators (IL-1β, IL-6, TNF-α, IFN-γ and PGE2), and increased level of IL-10. The protective effects of BSE against RA were also evident from the decrease in arthritis scoring and bone histology. The abilities to inhibit proinflammatory cytokines and modulation of antioxidant status suggest that the protective effect of Boswellia serrata extract on arthritis in rats might be mediated via the modulation of immune system. Boswellic acids reduce Th17 differentiation via blockade of IL-1β-mediated IRAK1 signaling. Interferon-gamma producing CD4(+) T (Th1) cells and IL-17-producing CD4(+) T (Th17) cells are involved in the pathogenesis of several autoimmune diseases including multiple sclerosis. Therefore, the development of treatment strategies controlling the generation and expansion of these effector cells is of high interest. Frankincense, the resin from trees of the genus Boswellia, and particularly its prominent bioactive compound acetyl-11-keto-β-boswellic acid (AKBA), have potent anti-inflammatory properties. Here, we demonstrate that AKBA is able to reduce the differentiation of human CD4(+) T cells to Th17 cells, while slightly increasing Th2- and Treg-cell differentiation. Furthermore, AKBA reduces the IL-1β-triggered IL-17A release of memory Th17 cells. AKBA may affect IL-1β signaling by preventing IL-1 receptor-associated kinase 1 phosphorylation and subsequently decreasing STAT3 phosphorylation at Ser727, which is required for Th17-cell differentiation. The effects of AKBA on Th17 differentiation and IL-17A release make the compound a good candidate for potential treatment of Th17-driven diseases. Eur J Immunol. 2014 Apr;44(4):1200-12. [Change in dissolution of chemical components of frankincense-myrrh before and after their compatibility and effect on no release of LPS-induced macrophage cells]. OBJECTIVE: To analyze the difference of chemical compounds of frankincense-myrrh before and after their compatibility, and evaluate the effect of differentiated compounds on NO generated by LPS-induced peritoneal macrophage cells in rats, in order to discuss synergetic material basis of frankincense-myrrh compatibility from the prospective of change in chemical constituents. METHOD: UPLC-Q-TOF-MS/MS combined technology was used to analyze the chemical components of frankincense-myrrh before and after their compatibility. MarkerLynx 4. 1 statistical software was used to analyze differentiated compounds before and after their compatibility. RESULT: The results of PCA showed that there were significant differences in the combined extracts of frankincense-myrrh and the chromatogram of their combined liquid, suggesting significant differences in their chemical compounds before and after their compatibility; after their compatibility, the dissolution of pentacyclic triterpenoid (alpha-boswellic acid, beta-boswellic acid) and tetracyclic triterpenoid (elemonic acid, 3-acetoxy-16-hydroxy-dammar-24-ene, 3-hydroxytirucalla-8,24-dien-21-oic acid or 3-hydroxytirucalla-7,24-dien-21-oic acid) increased notably, while the dissolution of both yclic sesquiterpenes and macrocyclic diterpenoids decreased. According to the evaluation on in vitro activity, 2-methoxy-8, 12-epoxy-germa-1 (10), 7, 11-triene-6-ketone, 2-methoxy-5-acetoxyl-furan-germa-1 (10)-alkene-6-ketone and 3-carbonyl Euphorbia kansui-8, 24-diene-21-carboxylic acid notably inhibited NO generated by LPS-induced peritoneal macrophage cells in rats. CONCLUSION: These findings provide scientific basis and reference for studies on anti-inflammatory material basis of frankincense-myrrh compatibility. Zhongguo Zhong Yao Za Zhi. 2013 Jan;38(2):179-85. Dietary phytochemicals as potent chemotherapeutic agents against breast cancer: Inhibition of NF-κB pathway via molecular interactions in rel homology domain of its precursor protein p105. BACKGROUND: Dietary phytochemicals consist of a wide variety of biologically active compounds that are ubiquitous in plants, many of which have been reported to have anti-tumor as well as anti-inflammatory properties. OBJECTIVE: In the present study, we aimed to validate these findings by using docking protocols and explicate the possible mechanism of action for a dataset of nine phytochemicals namely boswellic acid, 1-caffeoylquinic acid, ellagic acid, emodin, genistein, guggulsterone, quercetin, resveratrol, and sylibinin from different plants against the nuclear factor- kappaB (NF-κB) precursor protein p105, an important transcription factor reported to be overexpressed in breast cancer. MATERIALS AND METHODS: 2-D structures of all phytochemicals were retrieved from PubChem Compound database and their subsequent conversion into 3-D structures was performed by using online software system CORINA. The X-ray crystallographic structure of the NF-κB precursor p105 was extracted from Brookhaven Protein Data Bank. Molecular docking simulation study was carried out by using AutoDock Tools 4.0. RESULTS: Our results showed significant binding affinity of different phytochemicals with the Rel homology domain of the NF-κB precursor protein p105. Quercetin and 1-caffeoylquinic acid were found to be very effective inhibitors against target molecule as they showed binding energy of -12.11 and -11.50 Kcal/mol, respectively. The order of affinity of other ligands with p105 was found as follows: guggulsterone > sylibinin > emodin > resveratrol > genistein > boswellic acid > ellagic acid. CONCLUSION: Our in silico study has explored the possible chemopreventive mechanism of these phytochemicals against the NF-κB precursor protein p105 and deciphered that quercetin, 1-caffeoylquinic acid and guggulsterone were the potent inhibitors against target molecule. In addition, large scale preclinical and clinical trials are needed to explore the role of these chemotherapeutic molecules against the NF-κB precursor protein p105 in cure and prevention of breast cancer. NF-κB down-regulation and PARP cleavage by novel 3-α-butyryloxy-β-boswellic acid results in cancer cell specific apoptosis and in vivo tumor regression. The present study relates to the induction of apoptosis thereof cytotoxicity and anti-cancer activity displayed by semi-synthetic analog of Boswellic acid i.e. 3-α-Butyryloxy-β-boswellic acid (BOBA). The cytotoxicity data revealed the differential sensitivity of cancer cell lines towards BOBA which may display its impact against different types of cancers. Considering the inhibitory potential of BOBA, we further sought to understand the target for BOBA deciphering the mechanism of action leading to apoptotic cell death and it was for the first time reported about the triterpenoid ring especially the β-boswellic acid derivative is targeting PI3K pathway. Our data revealed that BOBA treatment provides evidence about the apoptotic nature showing the potential of targeting mitochondria dependent pathways during apoptosis in HL-60 cells. BOBA induced hypo-diploid sub-G(1) DNA population in HL-60 cells as was also evident from the pattern of DNA fragmentation and mitochondrial membrane potential (ΛΨm) loss. Morphological analysis under fluorescent and scanning electron microscopy displayed typical features such as cell shrinkage, membrane blebbing, chromatin condensation and nuclear fragmentation. These events paralleled with the down-regulation of NF-κB and induced PARP cleavage. Furthermore, it is noteworthy that BOBA also depicted significant growth inhibition in Ehrlich Ascitic Tumour (EAT), Ehrlich Ascitic Carcinoma (EAC) and Sarcoma- 180 tumour models. Taken together, BOBA treatment may represent as potential agent to the currently available anticancer agents in both prophylactic and/or therapeutic applications. Also, our findings may open up a new perspective in the construction of novel anticancer agents based on boswellic acids that will facilitate the development of these agents for anticancer therapeutics. Anticancer Agents Med Chem. 2013 Jun;13(5):777-90. OBJECTIVE: To evaluate the efficacy of boswellic acid against monosodium urate crystal-induced inflammation in mice. METHODS: The mice were divided into four experimental groups. Group I served as control; mice in group II were injected with monosodium urate crystal; group III consisted of monosodium urate crystal-induced mice who were treated with boswellic acid (30 mg/kg/b.w. ); group IV comprised monosodium urate crystal-induced mice who were treated with indomethacin (3 mg/kg/b.w.). Paw volume and levels/activities of lysosomal enzymes, lipid peroxidation, anti-oxidant status and inflammatory mediator TNF-α were determined in control and monosodium urate crystal-induced mice. In addition, the levels of β-glucuronidase and lactate dehydrogenase were also measured in monosodium urate crystal-incubated polymorphonuclear leucocytes (PMNL) in vitro. RESULTS: The activities of lysosomal enzymes, lipid peroxidation, and tumour necrosis factor-α levels and paw volume were increased significantly in monosodium urate crystal-induced mice, whereas the activities of antioxidant status were in turn decreased. However, these changes were modulated to near normal levels upon boswellic acid administration. In vitro, boswellic acid reduced the level of β-glucuronidase and lactate dehydrogenase in monosodium urate crystal-incubated PMNL in concentration dependent manner when compared with control cells. CONCLUSIONS: The results obtained in this study further strengthen the anti-inflammatory/antiarthritic effect of boswellic acid, which was already well established by several investigators. Asian Pac J Trop Biomed. 2012 Feb;2(2):128-33. Acyl derivatives of boswellic acids as inhibitors of NF-κB and STATs. Boswellic acid acylates including their epimers were synthesized and screened against a panel of human cancer cell lines. They exhibited a range of cytotoxicity against various human cancer cell lines thereby leading to the development of a possible SAR. One of the identified lead compounds was found to be an inhibitor of the NF-κB and STAT proteins, warranting further investigations to be developed into a potential anticancer lead. Bioorg Med Chem Lett. 2012 Jan;22(1):431-5. Effect of a Herbal-Leucine mix on the IL-1β-induced cartilage degradation and inflammatory gene expression in human chondrocytes. BACKGROUND: Conventional treatments for the articular diseases are often effective for symptom relief, but can also cause significant side effects and do not slow the progression of the disease. Several natural substances have been shown to be effective at relieving the symptoms of osteoarthritis (OA), and preliminary evidence suggests that some of these compounds may exert a favorable influence on the course of the disease. The objective of this study was to investigate the anti-inflammatory/chondroprotective potential of a Herbal and amino acid mixture containing extract of the Uncaria tomentosa, Boswellia spp., Lepidium meyenii and L-Leucine on the IL-1β-induced production of nitric oxide (NO), glycosaminoglycan (GAG), matrix metalloproteinases (MMPs), aggrecan (ACAN) and type II collagen (COL2A1) in human OA chondrocytes and OA cartilage explants. METHODS: Primary OA chondrocytes or OA cartilage explants were pretreated with Herbal-Leucine mixture (HLM, 1-10 μg/ml) and then stimulated with IL-1β (5 ng/ml). Effect of HLM on IL-1β-induced gene expression of iNOS, MMP-9, MMP-13, ACAN and COL2A1 was verified by real time-PCR. Estimation of NO and GAG release in culture supernatant was done using commercially available kits. RESULTS: HLM tested in these in vitro studies was found to be an effective anti-inflammatory agent, as evidenced by strong inhibition of iNOS, MMP-9 and MMP-13 expression and NO production in IL-1β-stimulated OA chondrocytes (p < 0.05). Supporting these gene expression results, IL-1β-induced cartilage matrix breakdown, as evidenced by GAG release from cartilage explants, was also significantly blocked (p < 0.05). Moreover, in the presence of herbal-Leucine mixture (HLM) up-regulation of ACAN and COL2A1 expression in IL-1β-stimulated OA chondrocytes was also noted (p < 0.05). The inhibitory effects of HLM were mediated by inhibiting the activation of nuclear factor (NF)-kB in human OA chondrocytes in presence of IL-1β. CONCLUSION: Our data suggests that HLM could be chondroprotective and anti-inflammatory agent in arthritis, switching chondrocyte gene expression from catabolic direction towards anabolic and regenerative, and consequently this approach may be potentially useful as a new adjunct therapeutic/preventive agent for OA or injury recovery. BMC Complement Altern Med. 2011 Aug;11():66. Gum resin of Boswellia serrata inhibited human monocytic (THP-1) cell activation and platelet aggregation. ETHNOPHARMACOLOGICAL RELEVANCE: Stem bark gum resin extract of Boswellia serrata is traditionally used in India for its hemostatic, antiinflammatory and cardiovascular health effects and it is named as Śallakī in Ayurvedic medicine. AIM OF THE STUDY: This study was conducted to evaluate the antioxidative and antithrombotic properties of stem bark gum resin extracts of Boswellia serrata (BS). MATERIALS AND METHODS: The inhibitory activity of the BSWE and BSAE on FeCl(3) induced lipid peroxidation (in vitro) in rat liver and heart homogenates was measured spectrophotometrically. Their effect on H(2)O(2) induced reactive oxygen species (ROS) generation in human monocytic (THP-1) cells was investigated by tracking intensity of a cell permeable fluorescent dye, H(2)DCFDA and subjecting the cell samples to confocal microscopy. Further, the effect of BSAE and BSWE on ADP-induced platelet aggregation was assessed using a multimode detection plate reader, plasma coagulation times using an automated blood coagulation analyzer and on human blood clotting factors Xa and XIa using chromogenic substrate. Phytomarker analysis of the water (BSWE) and hydroalcoholic (BSAE) extracts of BS-gum resin was done through HPLC using a standard compound AKβBA. RESULTS: BSAE and BSWE inhibited, to varied extents, the lipid peroxidation in liver (80%) and heart (50%) tissue homogenates of male Wistar rats. Further, BSAE (30 μg dwt/mL) and BSWE (300 μg dwt/mL) attenuated ≥ 60% of H(2)O(2) mediated ROS generation in THP-1 cells. In case of standard compounds, ascorbate (20 μg dwt/mL) and butylated hydroxytoluene (BHT) (10 μg dwt/mL) completely scavenged ROS in the cells. BSAE and BSWE at 3 mg dwt/mL completely inhibited ADP induced platelet aggregation and activities were comparable to 20 μg/mL of heparin. The extracts also showed very high activity in prolonging coagulation time periods. Both types of extracts extended prothrombin time (PT) from ∼13 to >60s and activated partial thromboplastin time (APTT) from ∼32s to >90s. BSAE inhibited clotting factors Xa and XIa remarkably at 6 μg of dwt where as BSWE did not show much effect on FXa and showed 30% inhibition on FXIa at 120 μg. 10 μg of heparin was required to inhibit about 30% activity of the above factors. HPLC analyses suggested that BSAE and BSWE had AKβBA of 9% (w/w) and 7.8% (w/w) respectively. CONCLUSION: Present study demonstrated antioxidant and antithrombotic anticoagulant activities of water and hydroalcoholic extracts of Boswellia serrata's gum resin. We suggest that BS-gum resin as a good source for lead/therapeutic compounds possessing antioxidant, antiplatelet and anticoagulant activities. There is significant number of evidences suggesting the anti-inflammatory properties of gum resin extracts of Boswellia serrata containing 3-O-acetyl-11-keto-β-boswellic acid (AKBA) and their promising potential as therapeutic interventions against inflammatory diseases such as osteoarthritis (OA). Unfortunately, the poor bioavailability of AKBA following oral administration might limit the anti-inflammatory efficacy of standardized Boswellia extract(s). To address this issue, we describe a novel composition called Aflapin, which contains B. serrata extract enriched in AKBA and non-volatile oil portion of B. serrata gum resin. Our observations show that the availability of AKBA in systemic circulation of experimental animals is increased by 51.78% in Aflapin-supplemented animals, in comparison with that of 30% AKBA standardized extract or BE-30 (5-Loxin(®)). Consistently, Aflapin confers better anti-inflammatory efficacy in Freund's Complete Adjuvant (FCA)-induced inflammation model of Sprague-Dawley rats. Interestingly, in comparison with BE-30, Aflapin(®) also provides significantly better protection from IL-1β-induced death of human primary chondrocytes and improves glycosaminoglycans production in human chondrocytes. In Tumor necrosis factor alpha (TNFα)-induced human synovial cells, the inhibitory potential of Aflapin (IC(50) 44.736 ng/ml) on matrix metalloproteinase-3 (MMP-3) production is 14.83% better than that of BE-30 (IC(50) 52.528 ng/ml). In summary, our observations collectively suggest that both the Boswellia products, BE-30 (5-Loxin(®)) and Aflapin, exhibit powerful anti-inflammatory efficacy and anti-arthritic potential. In particular, in comparison with BE-30, Aflapin provides more potential benefits in recovering articular cartilage damage or protection from proteolytic degradation due to inflammatory insult in arthritis such as osteoarthritis or rheumatoid arthritis. Mol Cell Biochem. 2011 Aug;354(1-2):189-97. Immunological adjuvant effect of Boswellia serrata (BOS 2000) on specific antibody and cellular response to ovalbumin in mice. In this study, the biopolymeric fraction BOS 2000 from Boswellia serrata was evaluated for its potential ability as adjuvants on the immune responses to ovalbumin (OVA) in mice. Balb/c mice were immunized subcutaneously with OVA 100 μg alone or with OVA 100 μg dissolved in saline containing alum (200 μg) or BOS 2000 (10, 20, 40 and 80 μg) on Days 1 and 15. Two weeks later, OVA specific antibodies in serum; concanavalin A (Con A), OVA stimulated splenocyte proliferation, CD4/CD8/CD80/CD86 analysis in spleen cells and its estimation of cytokines (IL-2 and IFN gamma) from cell culture supernatant were measured. OVA specific IgG, IgG1 and IgG2a antibody levels in serum were significantly enhanced by BOS 2000 (80 μg) compared with OVA control group. Moreover, the adjuvant effect of BOS 2000 (80 μg) on the OVA-specific IgG, IgG1, and IgG2a antibody responses to OVA in mice were more significant than those of alum. BOS 2000 significantly enhanced the Con A and OVA induced splenocyte proliferation in the OVA immunized mice especially at a dose of 80 μg (p<0.001). However, no significant differences were observed among the OVA group and OVA/alum group. At a dose of 80 μg (p<0.001), there was a significant increase in the CD4/CD8 and CD80/CD86 analysis in spleen cells and cytokine (IL-2 and IFN-gamma) profile in the spleen cell culture supernatant was observed. In conclusion, BOS 2000 seems to be a promising balanced Th1 and Th2 directing immunological adjuvants which can enhance the immunogenicity of vaccine. The aim of this study was to assess the anti-inflammatory efficacy of Boswellia frereana extracts in an in vitro model of cartilage degeneration and determine its potential as a therapy for treating osteoarthritis. Cartilage degradation was induced in vitro by treating explants with 5 ng/ml interleukin1alpha (IL-1alpha) and 10 ng/ml oncostatin M (OSM) over a 28-day period, in the presence or absence of 100 microg/ml B. frereana. Treatment of IL-1alpha/OSM stimulated cartilage explants with B. frereana inhibited the breakdown of the collagenous matrix. B. frereana reduced MMP9 and MMP13 mRNA levels, inhibited MMP9 expression and activation, and significantly reduced the production of nitrite (stable end product of nitric oxide), prostaglandin E2 and cycloxygenase-2. Epi-lupeol was identified as the principal constituent of B. frereana. This is the first report on the novel anti-inflammatory properties of Boswellia frereana in an in vitro model of cartilage degradation. We have demonstrated that B. frereana prevents collagen degradation, and inhibits the production of pro-inflammatory mediators and MMPs. Due to its efficacy we propose that B. frereana should be examined further as a potential therapeutic agent for treating inflammatory symptoms associated with arthritis. Targeting NF-kappa B with a natural triterpenoid alleviates skin inflammation in a mouse model of psoriasis. Psoriasis vulgaris is a common chronic inflammatory skin disease involving cytokines and an activated cellular immune system. At variance to skin from patients with atopic dermatitis or from healthy subjects, human psoriatic skin lesions exhibit strong activation of transcription factor NF-kappaB that is mainly confined to dermal macrophages, whereas only a few dendritic cells but no CD3+ lymphocytes show activated NF-kappaB. Since NF-kappaB signaling is required for the induction and/or function of many cytokines and aberrant cytokine expression has been proposed as an underlying cause of psoriasis, we investigated whether NF-kappaB targeting would affect the course of the disease in the CD18 hypomorphic (CD18(hypo)) mouse model of psoriasis. When mice with severe psoriasiform lesions were treated systemically or locally with the IkappaB kinase inhibitor acetyl-11-keto-beta-boswellic acid (AKbetaBA), NF-kappaB signaling and the subsequent NF-kappaB-dependent cytokine production as shown by the TNF-alpha production of macrophages were profoundly suppressed. Additionally, application of the compound counteracted the intradermal MCP-1, IL-12, and IL-23 expression in previously lesional skin areas, led to resolution of the abundant immune cell infiltrates, and significantly reduced the increased proliferation of the keratinocytes. Overall, the AKbetaBA treatment was accompanied by a profound improvement of the psoriasis disease activity score in the CD18(hypo) mice with reconstitution of a nearly normal phenotype within the chosen observation period. Our data demonstrate that NF-kappaB signaling is pivotal for the pathogenesis in the CD18(hypo) mouse model of psoriasis. Therefore, targeting NF-kappaB might provide an effective strategy for the treatment of psoriasis. Thrombin-induced expression of endothelial CX3CL1 potentiates monocyte CCL2 production and transendothelial migration. CX3CL1 (fractalkine, neurotactin) is the sole CX3C chemokine. It induces monocyte locomotion in its cleaved form, but in its membrane-anchored form, it also acts as an adhesion molecule. The expression of CX3CL1 is up-regulated in endothelial cells by proinflammatory cytokines such as IL-1 or TNF-alpha. Here, we studied the effect of the serine protease thrombin on endothelial CX3CL1 induction and its putative relevance for monocyte function. In HUVEC, thrombin triggered a time- and concentration-dependent expression of CX3CL1 at the mRNA and the protein level as shown by RT-PCR, Western immunoblotting, and flow cytometric analysis. Thrombin induced CX3CL1 by activating protease-activated receptor 1 (PAR1) as demonstrated by the use of PAR1-activating peptide and the PAR1-specific antagonist SCH 79797. The thrombin-induced CX3CL1 expression was NF-kappaB-dependent, as shown by EMSA, ELISA, and by inhibition of the NF-kappaB signaling pathway by the IkappaB kinase inhibitor acety-11-keto-beta-boswellic acid or by transient overexpression of a transdominant-negative form of IkappaBalpha. Upon cocultivation of human monocytes with HUVEC, the thrombin-dependent induction of membrane-anchored CX3CL1 in HUVEC triggered monocyte adhesion and an enhanced release of the MCP-1/CCL2 by monocytes and potentiated the monocyte transendothelial migration. Accordingly, the recombinant extracellular domain of CX3CL1 induced CCL2 release by monocytes. Thus, the thrombin-induced monocyte/endothelial cell cross-talk mediated by increased CX3CL1 expression potentiates the CCL2 chemokine generation that might contribute to the recruitment of monocytes into inflamed areas. J Leukoc Biol. 2008 Jul;84(1):215-23. Immunomodulatory activity of biopolymeric fraction BOS 2000 from Boswellia serrata. Oral administration of BOS 2000 (1-10 mg/kg) elicited a dose related increase in the delayed hypersensitivity reaction (early 24 h and delayed 48 h) in mice. It also stimulated the IgM and IgG titre expressed in the form of plaques (PFC) and complement fixing antibody titre. The concentration of cytokines (IL-4, IFN-gamma and TNF-alpha) in serum with respect to T cell interactions, i.e. (CD4/CD8) and the proliferation of lymphocytes were significantly increased at 10 mg/kg compared with the control. The results in these studies demonstrated the immunostimulatory effect of BOS 2000 in a dose-dependent manner with respect to the macrophage activation possibly expressing the phagocytosis and nitrite production by the enhancement of TNF-alpha and IFN-gamma production as a mode of action. OBJECTIVE: In this article, we studied the effect of acetyl-11-keto-beta-boswellic acid (AKbetaBA), a natural inhibitor of the proinflammatory transcription factor NF-kappaB on the development of atherosclerotic lesions in apolipoprotein E-deficient (apoE-/-) mice. METHODS AND RESULTS: Atherosclerotic lesions were induced by weekly LPS injection in apoE-/- mice. LPS alone increased atherosclerotic lesion size by approximately 100%, and treatment with AKbetaBA significantly reduced it by approximately 50%. Moreover, the activity of NF-kappaB was also reduced in the atherosclerotic plaques of LPS-injected apoE-/- mice treated with AKbetaBA. As a consequence, AKbetaBA treatment led to a significant downregulation of several NF-kappaB-dependent genes such as MCP-1, MCP-3, IL-1alpha, MIP-2, VEGF, and TF. By contrast, AKbetaBA did not affect the plasma concentrations of triglycerides, total cholesterol, antioxidized LDL antibodies, and various subsets of lymphocyte-derived cytokines. Moreover, AKbetaBA potently inhibited the IkappaB kinase (IKK) activity immunoprecipitated from LPS-stimulated mouse macrophages and mononuclear cells leading to decreased phosphorylation of IkappaB alpha and inhibition of p65/NF-kappaB activation. Comparable AKbetaBA-mediated inhibition was also observed in LPS-stimulated human macrophages. CONCLUSIONS: The inhibition of NF-kappaB activity by plant resins from species of the Boswellia family might represent an alternative for classical medicine treatments for chronic inflammatory diseases such as atherosclerosis. Arterioscler Thromb Vasc Biol. 2008 Feb;28(2):272-7. Incensole acetate, a novel anti-inflammatory compound isolated from Boswellia resin, inhibits nuclear factor-kappa B activation. Boswellia resin is a major anti-inflammatory agent in herbal medical tradition, as well as a common food supplement. Its anti-inflammatory activity has been attributed to boswellic acid and its derivatives. Here, we re-examined the anti-inflammatory effect of the resin, using inhibitor of nuclear factor-kappaB alpha (IkappaB alpha) degradation in tumor necrosis factor (TNF) alpha-stimulated HeLa cells for a bioassay-guided fractionation. We thus isolated two novel nuclear factor-kappaB (NF-kappaB) inhibitors from the resin, their structures elucidated as incensole acetate (IA) and its nonacetylated form, incensole (IN). IA inhibited TAK/TAB-mediated IkappaB kinase (IKK) activation loop phosphorylation, resulting in the inhibition of cytokine and lipopolysaccharide-mediated NF-kappaB activation. It had no effect on IKK activity in vitro, and it did not suppress IkappaB alpha phosphorylation in costimulated T-cells, indicating that the kinase inhibition is neither direct nor does it affect all NF-kappaB activation pathways. The inhibitory effect seems specific; IA did not interfere with TNFalpha-induced activation of c-Jun N-terminal kinase (JNK) and p38 mitogen-activated protein kinase. IA treatment had a robust anti-inflammatory effect in a mouse inflamed paw model. Cembrenoid diterpenoids, specifically IA and its derivatives, may thus constitute a potential novel group of NF-kappaB inhibitors, originating from an ancient anti-inflammatory herbal remedy. A new vaccine adjuvant (BOS 2000) a potent enhancer mixed Th1/Th2 immune responses in mice immunized with HBsAg. Adjuvants in vaccines are immune stimulants that play an important role in the induction of effective and appropriate immune responses to vaccine component. In search of a potent vaccine adjuvant, the water-soluble biopolymeric fraction BOS 2000 from Boswellia serrata was evaluated for desired activity. We investigated the ability of BOS 2000 to enhance HBsAg specific immune responses. The effect was determined in the form of protective anti-HBsAg titers, neutralizing antibodies (IgG1 and IgG2a), spleen cell lymphocyte proliferation by using MTT assay, Th1 (IFN-gamma and TNF-alpha) and Th2 (IL-4) cytokines as well as T-lymphocyte subsets (CD4/CD8) and intracellular cytokines (IFN-gamma/IL-4), these responses were highest in BOS 2000 immunized mice. Alum induced only a modest enhancement of antibody responses. Reducing the dose of adjuvant by 18.1-fold in comparison to alum, total IgG and its subtypes (IgG1 and IgG2a) antibodies titer in serum was significantly enhanced. Analysis of HBsAg specific cytokines revealed that alum was associated with a predominantly IL-4 response. In contrast, BOS 2000 was associated with production of both IFN-gamma and IL-4. We conclude that BOS 2000 is a potent enhancer of antigen-specific Th1 and Th2 immune responses in comparison to alum with Th2 limitation and is a promising adjuvant for vaccine applications. Acetyl-11-keto-beta-boswellic acid potentiates apoptosis, inhibits invasion, and abolishes osteoclastogenesis by suppressing NF-kappa B and NF-kappa B-regulated gene expression. Acetyl-11-keto-beta-boswellic acid (AKBA), a component of an Ayurvedic therapeutic plant Boswellia serrata, is a pentacyclic terpenoid active against a large number of inflammatory diseases, including cancer, arthritis, chronic colitis, ulcerative colitis, Crohn's disease, and bronchial asthma, but the mechanism is poorly understood. We found that AKBA potentiated the apoptosis induced by TNF and chemotherapeutic agents, suppressed TNF-induced invasion, and inhibited receptor activator of NF-kappaB ligand-induced osteoclastogenesis, all of which are known to require NF-kappaB activation. These observations corresponded with the down-regulation of the expression of NF-kappaB-regulated antiapoptotic, proliferative, and angiogenic gene products. As examined by DNA binding, AKBA suppressed both inducible and constitutive NF-kappaB activation in tumor cells. It also abrogated NF-kappaB activation induced by TNF, IL-1beta, okadaic acid, doxorubicin, LPS, H2O2, PMA, and cigarette smoke. AKBA did not directly affect the binding of NF-kappaB to the DNA but inhibited sequentially the TNF-induced activation of IkappaBalpha kinase (IKK), IkappaBalpha phosphorylation, IkappaBalpha ubiquitination, IkappaBalpha degradation, p65 phosphorylation, and p65 nuclear translocation. 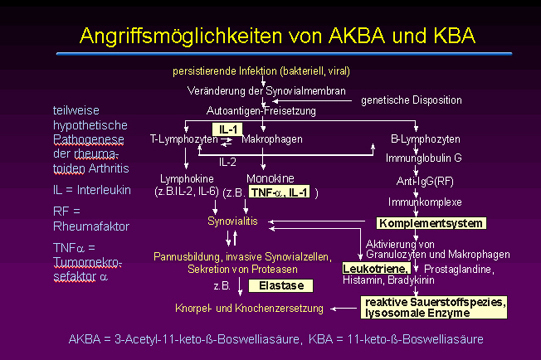 AKBA also did not directly modulate IKK activity but suppressed the activation of IKK through inhibition of Akt. Furthermore, AKBA inhibited the NF-kappaB-dependent reporter gene expression activated by TNFR type 1, TNFR-associated death domain protein, TNFR-associated factor 2, NF-kappaB-inducing kinase, and IKK, but not that activated by the p65 subunit of NF-kappaB. Overall, our results indicated that AKBA enhances apoptosis induced by cytokines and chemotherapeutic agents, inhibits invasion, and suppresses osteoclastogenesis through inhibition of NF-kappaB-regulated gene expression. Extract of gum resins of Boswellia serrata L. inhibits lipopolysaccharide induced nitric oxide production in rat macrophages along with hypolipidemic property. Boswellia serrata, Linn F (Burseraceae) is commonly used in Indian system of medicine (Ayurvedic) as an anti-inflammatory, analgesic, anti-arthritic and anti-proliferative agent. This study was planned to investigate the water-soluble fraction of the oleoresin gum of Boswellia serrata (BS extract) on lipopolysaccharide (LPS) induced nitric oxide (NO) production by macrophages under in vivo and in vitro conditions. In the previous condition, rats were fed on atherogenic diet (2.5% cholesterol, 1% cholic acid, 15.7 % saturated fat) along with the BS extract for 90 days. Blood was collected for lipid profile and toxicological safety parameters. Peritoneal macrophages were isolated and cultured to see the LPS induced NO production. Under in vivo experiment, BS extract significantly reduced serum total cholesterol (38-48 %), increased serum high-density lipoprotein- cholesterol (HDL-cholesterol, 22-30%). Under in vitro experiments with thioglycolate activated macrophages, it inhibited LPS induced (NO) production with IC 50 value at 662 ng /ml. Further, this fraction, in the dose of 15 mg/100 g body wt for 90 days, did not show any increase in serum glutamate-pyruvate transaminase (SGPT) and blood urea, in normal control animals. However, it significantly reversed the raised SGPT and blood urea in the atherogenic diet-fed animals. Transverse section of liver and kidney also supported its protective effect. Thus it may be concluded that water extract of Boswellia serrata possesses strong hypocholesterolemic property along with increase in serum HDL. It inhibits the LPS induced NO production by the activated rat peritoneal macrophages and show hepato-protective and reno-protective property. Indian J Exp Biol. 2005 Jun;43(6):509-16. Boswellia carterii extract inhibits TH1 cytokines and promotes TH2 cytokines in vitro. Traditional herbal formulas used to treat inflammatory arthritis in China and India include Boswellia carterii or Boswellia serrata. They both contain boswellic acids (BAs) which have been shown to exhibit anti-inflammatory and antiarthritic properties. This study tests the hypothesis that mixtures of BAs derived from B. carterii have immunomodulatory properties. B. carterii plant resin obtained from China was prepared as an ethanol extract, and the presence of seven BAs was confirmed by column chromatography, high-performance liquid chromatography, and UV laser desorption/ionization tandem mass spectroscopy. The extract was then tested for its ability to alter in vitro production of TH1 cytokines (interleukin-2 [IL-2] and gamma interferon) and TH2 cytokines (IL-4 and IL-10) by murine splenocytes. Delivery of the resin extract using ethanol as a solvent resulted in significant cellular toxicity not seen with the addition of ethanol alone. By contrast, delivery of the resin extract using a sesame oil solvent resulted in a dose-dependent inhibition of TH1 cytokines coupled with a dose-dependent potentiation of TH2 cytokines. These results indicate that a purified mixture of BAs from B. carterii plant resin exhibits carrier-dependent immunomodulatory properties in vitro. Clin Diagn Lab Immunol. 2005 May;12(5):575-80. Human genome screen to identify the genetic basis of the anti-inflammatory effects of Boswellia in microvascular endothelial cells. Inflammatory disorders represent a substantial health problem. Medicinal plants belonging to the Burseraceae family, including Boswellia, are especially known for their anti-inflammatory properties. The gum resin of Boswellia serrata contains boswellic acids, which inhibit leukotriene biosynthesis. A series of chronic inflammatory diseases are perpetuated by leukotrienes. Although Boswellia extract has proven to be anti-inflammatory in clinical trials, the underlying mechanisms remain to be characterized. TNF alpha represents one of the most widely recognized mediators of inflammation. One mechanism by which TNFalpha causes inflammation is by potently inducing the expression of adhesion molecules such as VCAM-1. We sought to test the genetic basis of the antiinflammatory effects of BE (standardized Boswellia extract, 5-Loxin) in a system of TNF alpha-induced gene expression in human microvascular endothelial cells. We conducted the first whole genome screen for TNF alpha- inducible genes in human microvascular cells (HMEC). Acutely, TNF alpha induced 522 genes and downregulated 141 genes in nine out of nine pairwise comparisons. Of the 522 genes induced by TNF alpha in HMEC, 113 genes were clearly sensitive to BE treatment. Such genes directly related to inflammation, cell adhesion, and proteolysis. The robust BE-sensitive candidate genes were then subjected to further processing for the identification of BE-sensitive signaling pathways. The use of resources such as GenMAPP, KEGG, and gene ontology led to the recognition of the primary BE-sensitive TNF alpha-inducible pathways. BE prevented the TNF alpha-induced expression of matrix metalloproteinases. BE also prevented the inducible expression of mediators of apoptosis. Most strikingly, however, TNF alpha-inducible expression of VCAM-1 and ICAM-1 were observed to be sensitive to BE. Realtime PCR studies showed that while TNF alpha potently induced VCAM-1 gene expression, BE completely prevented it. This result confirmed our microarray findings and built a compelling case for the anti-inflammatory property of BE. In an in vivo model of carrageenan-induced rat paw inflammation, we observed a significant antiinflammatory property of BE consistent with our in vitro findings. These findings warrant further research aimed at identifying the signaling mechanisms by which BE exerts its anti-inflammatory effects. DNA Cell Biol. 2005 Apr;24(4):244-55. Acetyl-boswellic acids inhibit lipopolysaccharide-mediated TNF-alpha induction in monocytes by direct interaction with IkappaB kinases. Expression of proinflammatory cytokines by monocytes is tightly regulated by transcription factors such as NF-kappaB. In this study, we show that, in LPS-stimulated human peripheral monocytes, the pentacyclic triterpenes acetyl-alpha-boswellic acid (AalphaBA) and acetyl-11-keto-beta-boswellic acid (AKbetaBA) down-regulate the TNF-alpha expression. AalphaBA and AKbetaBA inhibited NF-kappaB signaling both in LPS-stimulated monocytes as detected by EMSA, as well as in a NF-kappaB-dependent luciferase gene reporter assay. By contrast, the luciferase expression driven by the IFN-stimulated response element was unaffected, implying specificity of the inhibitory effect observed. Both AalphaBA and AKbetaBA did not affect binding of recombinant p50/p65 and p50/c-Rel dimers to DNA binding sites as analyzed by surface plasmon resonance. Instead, both pentacyclic triterpenes inhibited the LPS-induced degradation of IkappaBalpha, as well as phosphorylation of p65 at Ser(536) and its nuclear translocation. AalphaBA and AKbetaBA inhibited specifically the phosphorylation of recombinant IkappaBalpha and p65 by IkappaBalpha kinases (IKKs) immunoprecipitated from LPS-stimulated monocytes. In line with this, AalphaBA and AKbetaBA also bound to and inhibited the activities of active human recombinant GST-IKKalpha and His-IKKbeta. The LPS-triggered induction of TNF-alpha in monocytes is dependent on IKK activity, as confirmed by IKK-specific antisense oligodeoxynucleotides. Thus, via their direct inhibitory effects on IKK, AalphaBA and AKbetaBA convey inhibition of NF-kappaB and subsequent down-regulation of TNF-alpha expression in activated human monocytes. These findings provide a molecular basis for the anti-inflammatory properties ascribed to AalphaBA- and AKbetaBA-containing drugs and suggest acetyl-boswellic acids as tools for the development of novel therapeutic interventions. Extract of gum resin of B. serrata containing 60% acetyl 11-keto beta boswellic acid (AKBA) along with other constituents such as 11-keto beta-boswellic acid (KBA), acetyl beta-boswellic acid and beta-boswellic acid has been evaluated for antianaphylactic and mast cell stabilizing activity using passive paw anaphylaxis and compound 48/80 induced degranulation of mast cell methods. The extract inhibited the passive paw anaphylaxis reaction in rats in dose-dependant manner (20, 40 and 80 mg/kg, po). However, the standard dexamethasone (0.27 mg/kg, po) revealed maximum inhibition of edema as compared to the extract. A significant inhibition in the compound 48/80 induced degranulation of mast cells in dose-dependant manner (20, 40 and 80 mg/kg, po) was observed thus showing mast cell stabilizing activity. The standard disodium cromoglycate (50 mg/kg, ip) was found to demonstrate maximum per cent protection against degranulation as compared to the extract containing 60% AKBA. The results suggest promising antianaphylactic and mast cell stabilizing activity of the extract. Indian J Exp Biol. 2003 Dec;41(12):1460-2. Boswellic acid, a potent antiinflammatory drug, inhibits rejection to the same extent as high dose steroids. Effects of boswellic acid of Boswellia serrata and other triterpenic acids on the complement system. 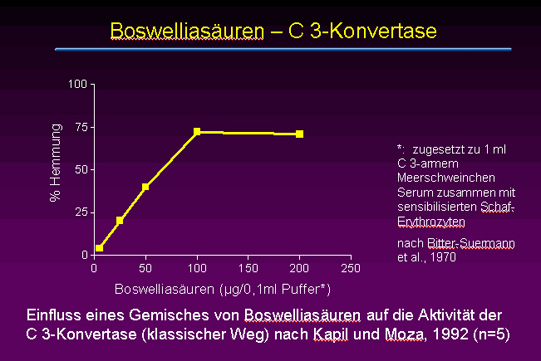 β-boswellic acid (BA), one major constituent of the resin of Boswellia serrata and other triterpenic acids of plant origin (crataegolic-, ursolic-, oleanolic- and glycyrrhetic acid) were found to possess anti-complementary activity in the classical and in the alternative complement pathway. Significant reduction of immunohemolysis in vitro was observed at BA concentrations between 0.005-0.1 mM with an IC(50) value of about 10 μmol/l. Anticomplementary activity of boswellic acids--an inhibitor of C3-convertase of the classical complement pathway. Boswellic acids (BA), an anti-inflammatory and anti-arthritic principle/s of Boswellia serrata, were found to possess anticomplementary activity. It inhibits the in vitro immunohaemolysis of antibody-coated sheep erythrocytes by pooled guinea-pig serum. The reduced immunohaemolysis was found to be due to inhibition of C3-convertase of the classical complement pathway. The threshold concentration for inhibiting C3-convertase was found to be 100 micrograms. However, higher concentrations of BA showed constant inhibitory effects on immunohaemolysis. BA also exhibited weak inhibitory effects on individual components of the complement system. In vivo administration of BA also showed the inhibitory effect on guinea-pig serum. Int J Immunopharmacol. 1992 Oct;14(7):1139-43. Effect of salai guggal ex-Boswellia serrata on cellular and humoral immune responses and leucocyte migration. Effect of alcoholic extract of salai guggal (AESG) was studied on cellular and humoral immune responses in mice and leucocyte migration in rats. Oral administration of AESG strongly inhibited the antibody production and cellular responses to sheep red blood cells in mice. It inhibited the infiltration of polymorphonuclear leucocytes and reduced the volume of pleural exudate in carrageenan induced pleurisy in rats. It showed no cytotoxic effect.